Manoj Prabhakar secretly recorded audio of chats to fix cricket matches. Stung: Azharuddin, Ajay Jadeja and others. All cleared after initial bans from cricket. Prabhakar also probed. Stung: R.K. Anand. Apologised after conviction for contempt of court, barred temporarily from practice and stripped of designation. Stung: Babu Bajrangi, others accused in riots. Footage helped convict Bajrangi. Posed as artist hiring Sri Ram Sena activists to disrupt an event. Stung: Pramod Muthalik, other functionaries. Sena lost credibility as Hindutva outfit. BJP boycotted Muthalik. Posed as wealthy customers looking to launder cash through banks. Stung: Top execs of HDFC, ICICI, Axis Bank. RBI fined banks. Banks held probes, fired and suspended employees. Stung: Mukul Roy, other top TMC leaders. Charges are being probed. Stung: Times Group, Zee Media, India Today, Hindustan Times, 40 others. All claim edited videos, some claim ‘reverse sting’. A reporter assumes a disguise, changes his/her identity and goes undercover with hidden cameras. The danger, the thrill, the wide range of possibilities sound very romantic and at the same time raise concerns. Is it ethical journalism? Is it only just feeding into voyeurism for which there is a waiting audience? Should conversations caught surreptitiously on tape or camera later be made public? The latest debate has sprung from the two-part Operation 136, released by the investigative journalism outfit Cobrapost.com. The first part, targeting 17 media houses, was released during a press conference on March 26 and dominated social media conversations for days. Cobrapost’s press release lays out the way in which journalist Pushp Sharma assumed an undercover identity, ‘Acharya Atal’, and went about with a fictitious assignment of buying space for advertorials and planting news stories in various media outlets with an aim to polarise communities and manipulate elections. The second part shows the operation conducted on 27 other organisations and has created more ripples as those allegedly stung include some big media houses. Some of the people recorded talk of a compromised relationship with pol­i­t­icians while being baited by the und­­­e­r­c­over reporter. Many say they are willing to accept cash and some even describe the mechanism of cash payments to buy space. The notable exceptions are Dainik Samwad and the Bengali daily Bartaman. In fact, the latter’s marketing head gives Sharma a lecture on ethics when he raises the stakes tenfold to Rs 10 crore. Investigative journalism is put on trial every time a sting operation is unleashed on the viewer, a fix better than prime time TV debates. Media critic Sevanti Ninan points out the nuances surrounding journalistic endeavours that use hidden cameras. “A hidden camera recording an ongoing process is different from this situation, which is entrapment where you go with a fictitious proposition and a camera. This is problematic because it only proves that they are open to enticements. Tehelka’s Operation West End (2001) amounted to the same approach. Nevertheless, when you approach people with a fictitious pro­position, it does reveal their predilection for wrongdoing,” she says. This week, Al Jazeera released its sting operation on cricket. It used a ruse and hidden cameras, just as in Operation 136, to approach fixers and compromised officials. It revealed that a pitch had been tampered with in an India-Sri Lanka international Test match. It also showed that Dawood Ibrahim may still be pulling the strings of match-fixing in cricket and continues to run a betting racket in India. Is this exposing the rot in the system, or is it unethical journalism? “In the current scenario, if we had the money, we would have got all the diabolical things we suggested published in mainstream media. Isn’t that scary? You could not have done it on open cameras. If senior management and owners are going to sell their edi­torial space for big money, our democracy is in danger whatever else some media pundits might suggest,” says Aniruddha Bahal of Cobrapost. Stings created an ­industry of blackmail after Operation West End, says Newslaundry editor Madhu Trehan. But the danger in this kind of ope­ration is that it can quickly turn into plain blackmailing. “The issue is who does the sting. After the first couple of big stings, it became an enterprise. People set up small outfits and offered to sting people for money, and TV channels began to outsource stings,” says Ninan. Media commentator and Newslaundry editor Madhu Trehan points out that sting operations created a cottage industry of blackmail after Operation West End. “Tehelka’s Operation West End was the biggest of the lot. It led to politicians stinging each other. Pushp Sharma has been arrested in the past for forgery and faking a story. But people don’t look past the sensationalism to look at the credibility of the person doing it. In this case, it’s a freelancer, even though Cobrapost was supervising Sharma. It is journalistic free enterprise but comes across as slightly dubious,” says Trehan. “We have revealed the actual DNA of India’s media. Let us not fool ourselves into a spurious ethics debate when the spotlight needs to be on the people whom the reporter interacted with,” counters Bahal. Sharma has been involved in several controversies. In 2016, he was arrested on allegations of falsifying an annexure to an RTI reply, which purported to show that the AYUSH ministry does not hire Muslims as yoga instructors. The Delhi Police had claimed that he created the document. But a forensic examination revealed no trace of the document on his computer. The case is still being heard. An important mission of investigative journalism is to reveal the truth, with credible evidence. Do sting operations meet these conditions? “Cobrapost does all manner of investigations based on documents, RTIs and so forth. It’s just that we are so good at hidden camera that they get talked about more. There are some stories that cannot be done without the use of hidden camera,” stresses Bahal. Ninan doesn’t agree. “A sting operation is different from investigative journalism, which finds wrongdoing and exposes it with evidence. Here, it is hypothetical evidence and it will be sad if this becomes the most popular form of investigative journalism,” she says. Trehan is clear about where sting operations are permissible. “I believe sting operations are valid but only if set standards are met. First, they should be for public good and should only be conducted if there is no other way to prove the story. Second, I am deeply concerned about selective editing. For example, Tehelka in Operation West End excluded a recording of an honest bureaucrat, Doodani. He threw them out and threatened to call the CBI. Tehelka excluded all the footage that incriminated their own reporter, such as kissing a prostitute while trying to ­persuade her to go with an army officer. So, while exposing corruption, what about their own dishonesty and cover-up,” she points out. In March 2018, Britain’s Channel 4 News released videos of a sting operation conducted by its undercover reporters on Cambridge Analytica. The reporters had approached the firm to help elect an official in Sri Lanka. The Cambridge Analytica official bragged about how they misused private data of users for elections—and this amounted to a real offence rather than just a potential crime, the latter being the only thing a fictitious contract would establish. As a result, Facebook and its founder Mark Zuckerberg had to answer to the US Congress. Some sting operations do serve the public interest. 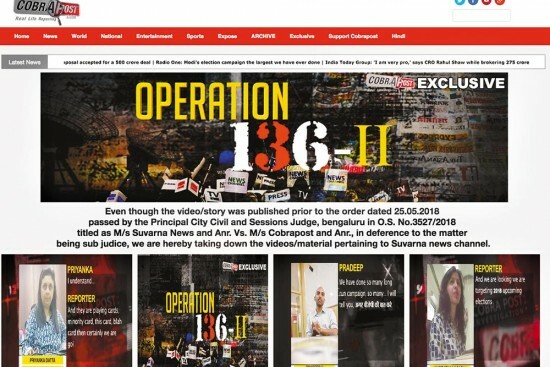 Cobrapost named the sting Operation 136 to reflect India’s pos­ition on the World Press Freedom Index. By the time the second part was released, it had dropped by two places to 138. Disclosure: Aniruddha Bahal was a journalist with Outlook till 2000. This refers to Secret Handshakes with a Serpent (June 11), your story on the Cobrapost media expose. Sting operations are valid only if certain standards are met. Unfortuna­tely, many sting operations are overhyped to present bia­sed imp­ressions of events, appealing to emotions and, at times, ­intentionally omitting facts. This happens when the profit or publicity mot­ive drives editorial preference for sensational stories. Journalists have a duty to give both sides of a story. We are in dire need of positive journalism, that calls for raising the morale of the public by showing that everyone in the country is not dishonest. Come to think of it, the system works due to the honesty of the many, which countervails the dishonesty of a few.